Believe it or not, power grids have FANs. Not the kind of fans that keep you cool in summer. Rather, field area networks (FANs), which make power distribution possible. These critical communications networks are very important to power utilities, as my colleague also addressed in his recent blog (Lighting up the utility industry with modern communications networks). And the newest Nokia wireless router— the 7705 Service Aggregation Router (SAR-Hm) — which was recently named a 2017 Smart Grid Product of the Year, delivers the innovation needed to create converged FANs that enable more efficient and reliable smart grid operations. Power utilities worldwide are in the midst of a significant transformation as they gear up to meet new market forces, green environmental regulations and disruptive renewable energy technologies. Grid efficiency, reliability, power quality and automation are all key areas that will require improved FANs. At the same time, power utilities are striving to match supply and demand more proficiently to manage the duck curve. Named after its distinctive shape, the curve shows a timing imbalance between peak demand and renewable energy production over the course of a day (see this SmartCitiesWorld article about managing the duck curve). As a result, power utilities need real-time oversight and visualization of the grid. One way to improve grid efficiency is to reduce electrical loss with the use of advanced voltage and volt-ampere reactive optimization (VVO). This is made possible through recent improvements in sensors, intelligent electronic devices (IEDs), broadband communications, control algorithms, and information processing technologies used to monitor and control grid distribution systems. The Nokia 7705 SAR-Hm is designed and purpose-built to do just that. It enables power utilities to modernize and automate their distribution systems, and help them have better oversight and control of their grids at all times. In short, it makes it easier for power utililties to create converged FANs which support both today’s and emerging smart grid applications. Today’s FANs are application-specific and based on technologies that are either narrowband, proprietary, or using unlicensed or lightly licensed spectrum. Without the ability to scale and manage the network, remote monitoring and control of devices is challenging, costly and extremely difficult to operate and deploy as applications are becoming more “intelligent”. This creates high operational costs, limits FAN evolution, impedes grid application integration, and stalls future innovation. 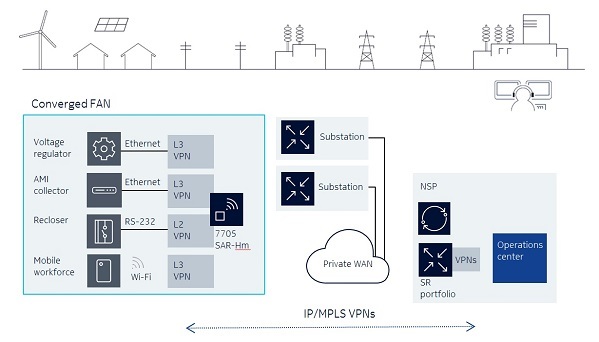 By creating a converged FAN with the help of the 7705 SAR-Hm, power utilities can leverage the benefits of IP/MPLS and LTE technologies to enable IP/MPLS services wirelessly for grid devices located deep in a highly scalable distribution network. This makes it easier to introduce smart grid applications, integrate renewable energy sources, and lay the groundwork to support an anticipated massive increase in field devices with the Internet of Things (IoT). Hot on the heels of its market release earlier this year, the 7705 SAR-Hm was named a 2017 Smart Grid Product of the Year. IoT Evolution World, the premier resource for current information about the exploding IoT market, announced the award last month, recognizing Nokia’s innovation in smart grid technologies. Want to know more? Download this datasheet to learn about the 7705 SAR-Hm.